Fritillaria is a genus of bulbous monocots within the lily family (Liliaceae; Fig. 1) and includes species with truly giant genomes, ranging from c. 30,000 to c. 85,000 Mb (among these is the largest recorded genome for a diploid plant species (Ambrožová et al. 2011); see Fig. 1b, Fig. 2). Figure (left) shows species representing some of the major subgeneric groups within Fritillaria. 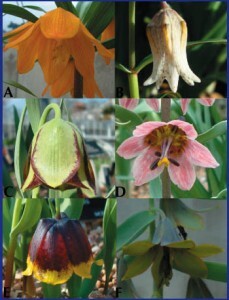 A) F. eduardii, subgenus Petilium; B) F. japonica, subgenus Japonica (which has the largest recorded genome for a diploid plant species); C) F. hermonis, subgenus Fritillaria; D) F. gibbosa, subgenus Rhinopetalum; E) F. michailovskyi, subgenus Fritillaria ; F) F. sewerzowii, subgenus Korolkovia. Copyright Laura J. Kelly. Genome size change in the genus has occurred independently of polyploidisation, as almost all species are diploid (Fig. 2 shows monoploid genome sizes). 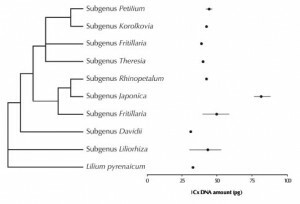 Moreover, the phylogenetic distribution of Fritillaria species with the largest genomes indicates that independent shifts towards giant genomes (1C-value ≥ 35 pg) have occurred during the evolution of the genus (Leitch et al. 2007; Fig. 2). The presence of a range of genome sizes, as well as the separate instances of genome size change, makes Fritillaria an ideal group in which to study the dynamics of genome size evolution in plants. In this project we are analysing the giant genomes of species of Fritillaria in order to identify the key sequences contributing to genome obesity, and to explore the evolutionary processes that underlie this phenomenon. Figure (left) shows monoploid genome sizes for Fritillaria plotted against a phylogenetic tree (based on three plastid regions; Leitch et al. 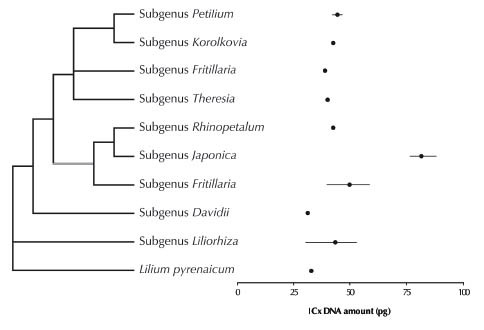 unpublished data) summarising relationships between the eight recognised subgenera (subgenus Fritillaria is polyphyletic on the basis of DNA sequence data); a representative species from the sister group to Fritillaria, Lilium, is also included. The range of 1Cx values (monoploid genome size (cf. Greilhuber et al. 2005) calculated by dividing 2C value by ploidy level) recorded for each of the subgeneric groups is indicated with a line; the mean value is shown by ·. Copyright Laura J. Kelly.